Are you paying too much on your electricity bill? Would like to increase work productivity? Want to help environment? If you said yes to one of these questions we have the answers. As lighting contractors in Sydney, we deal direct with the manufactures to offer you a quality product at the right price. We offer a number of package deals and discounts ranging from replacement; bulbs, down lights, fluro tubes, flood lights, custom high bays, light kits, emergency exit, indoors, street lighting, components, dimmer switch, arrays, parts and new LED strip RGB lights suited for the environment. 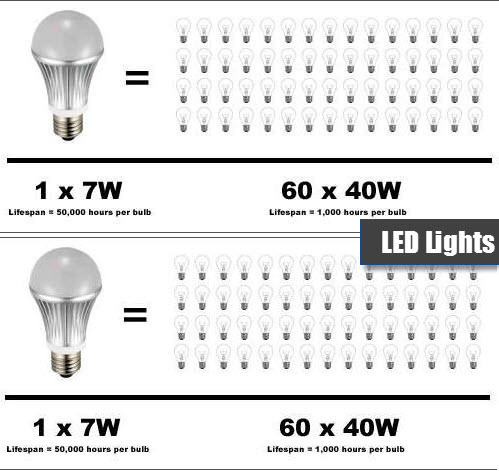 The life span of most of our LED lights is 50,000 hours or more. That means that this light would last for 17.1 years if it was used 8 hours per day. Energy efficiency is incredible, saving you up to 90% as compared to halogen lamps. Environmentally friendly, 100% recyclable and no toxic mercury. Will help you to reduce your carbon footprint by up to 90%. Improve work productivity by 8%, tasks performance by 16%, reduces rejects by 29%, reducing accidents rates by 52%, all this by simply increasing light levels from 300 lux to 2000 lux. OH&S safety LEd lights do not flicker, safe for migraine or epileptic sufferers. LED tubes are made from “unbreakable” plastic not glass. Instant lighting when you flick a switch on, unlike high bay traditional lights. No UV rays, which means that artwork and other organic materials will not be harmed. Perfect for external solar energy use, consumes low amounts of power. We always keep ourselves up to date with the latest developments in the electrical field. Our electricians are given timely training on the different new techniques and installation ways to offer the best services always. We highly recommend our clients to get LED Lightings installed at their places in order to reduce electricity bills and save the environment. We have direct dealings with the best manufacturers in Sydney to offer the quality products at a justifiable price. To make these LED installations an easy and affordable thing for our clients, we even offer a number of package deals that includes bulbs, down lights, fluoro tubes, flood lights, high bays, emergency exits, street lighting, LED strip RGB lights etc. 100% recyclable and no toxic mercury. The main reason why the use of LED lighting is being emphasized and followed by people is that these are a very good source of illumination and contain no toxic elements like mercury, which are dangerous for the environment. LED’s are 100% recyclable which means that they even reduce carbon footprint. Zero Ultra Violet (UV) Rays Emission, making suitable also for art galleries and museums. LED Lights emit almost zero UV lights which make them perfect to be used for illuminating the UV Sensitive objects in museums and art galleries. LED Lights are best for the products that are sensitive to heat. LED Lights are of robust quality and are made with the components that highly rugged and can withstand tough surroundings. These are even resistant to mild shocks and other external impacts which make them good to be used for outdoor lightings. Our electricians carry complete knowledge on how to install LED Lights and light up the premises with latest technology and designs available. Book a meeting with us and take a step towards a cleaner environment! A lighting solution can be defined as an intentional application of lights for aesthetic purpose. Lighting is used both outdoors and indoors. Indoor lighting is a combination of natural light and artificial lighting. The types of light bulbs used in either case are different from each other. Lighting of your home impacts your mood. You can alter the appearance of a room with appropriate lighting. Lighting makes a large room seem cozy or a small room look spacious. Indoor lighting entails the usage of appropriate lighting fixtures. These fixtures not only fulfill the basic purpose of lighting up the room but also enhance its ambiance. However, lighting fixtures are a source of energy consumption. Hence, the right mix of lighting fixtures must be selected to beautify your home without hurting your pocket. Some lighting solutions are also detrimental to the environment. Therefore, the impact of the light source on the environment must be borne in mind before selecting it. This is the basic filament bulb that was invented by Thomas Alva Edison. The working of this type of bulb can be explained as the production of light on heating the filament on the passage of electric current. The main drawback of this type of bulb is that it has low efficiency. These bulbs are spiral in shape. The principle of working is exciting the gas inside the coils to produce light. The gas is excited by passing electricity through it. These bulbs have a coating on the spirals imparting a white color to the light. These bulbs have better efficiency than incandescent bulbs. LEDs are the latest lighting solution available in the market. They are semiconductor devices which emit light on passing electric current. This option of lighting has proved to be very popular in recent times. They can be considered to be a ‘digital’ lighting solution compared to their ‘analog’ counterparts. These bulbs have a long life. Hence, they do not warrant frequent changes. They are compact in size. Hence, are available in a variety of shapes and sizes. They can be selected appropriately to be mounted in hard to reach places. These bulbs work on low energy. Hence, they enable you to reduce your expenses towards electricity. These bulbs emit minimal heat and UV rays. This is beneficial as it does not harm plants and artwork mounted indoors. LEDs are safe for the environment. This is because they do not contain any toxic materials. They can be recycled. Hence, they help in reducing carbon footprint. LEDs are more sturdy than other lighting solutions. This is because they are rugged and can withstand rough conditions. They can function on low voltage. Hence, can be used conveniently in outdoor settings as well. We see that LED bulbs have numerous benefits compared to other options of lighting. Hence, their usage can save your money and the planet. They are definitely a smart lighting solution.